In a classic tale of temptation and duplicity, Neron, a demon from Hell, assembles the villains of the universe and offers them their ""heart's desire"" in exchange for their souls. 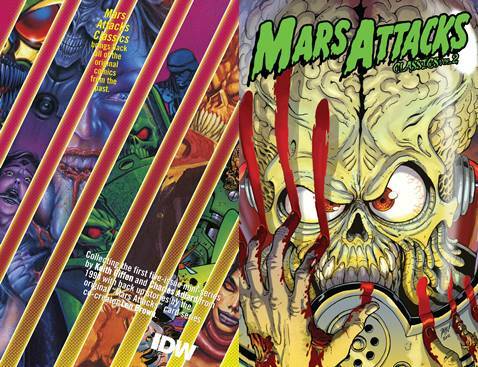 As each criminal individually accepts the damned bargain, the heroes of Earth are suddenly overpowered and easily defeated by their evil adversaries. 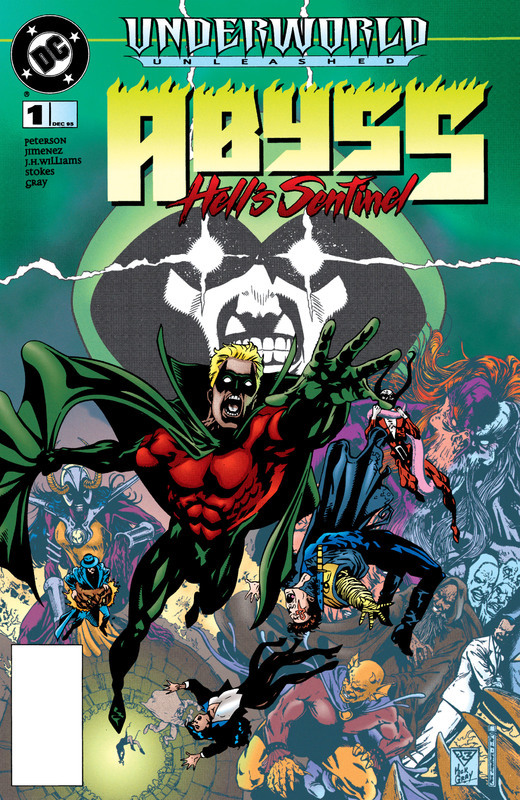 But the augmented villains soon learn the horrible price they must pay as Neron uses his unwitting pawns in an attempt to take over the entire universe. Now with Superman, Batman, Green Lantern, Wonder Woman, the Flash and the rest of the heroes of the world helpless, the fate of all existence rests on the shoulders of the Trickster, the one man who might outdeal the devil. Slade Wilson - known to his enemies and allies as Deathstroke, the Terminator - is the world's deadliest assassin. But this time, the legendary mercenary has been tasked with saving a life. A rogue neo-Nazi group called Fire and Blood is building a deadly army hell-bent on killing countless people. Deathstroke has been hired to rescue an ambassador's son who was abducted by the group. Can Deathstroke take down an entire army of lunatics while keeping the young political prisoner safe? Find out in Deathstroke, the Terminator Vol. 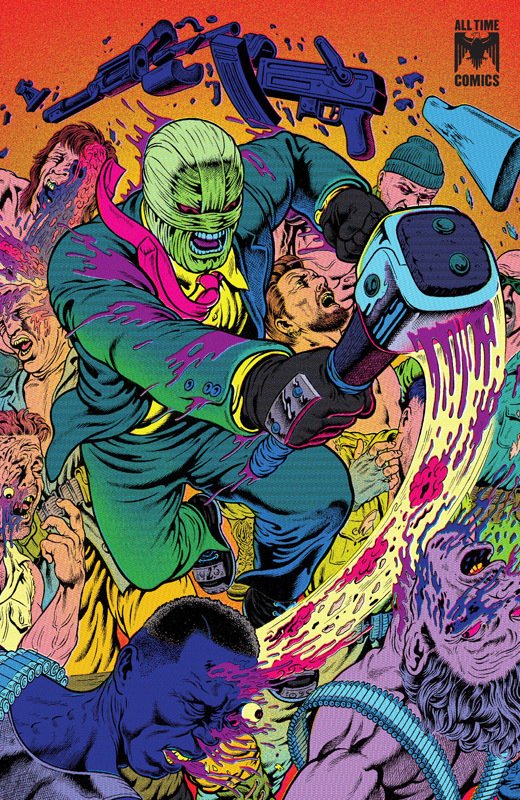 4: Crash or Burn, featuring classic stories about the man who kills for a living, written by Steven Grant with art by Steve Erwin, Gabriel Morrissette, John Statema, Will Blyberg and others. Collects Deathstroke, the Terminator (1991-1996) #21-25 and Annual #2. 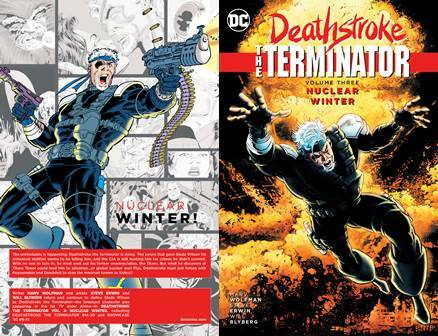 Writer Marv Wolfman and artists Steve Erwin and Will Blyberg return and continue to define Slade Wilson as Deathstroke the Terminator - the breakout character from the hit TV show Arrow - in DEATHSTROKE THE TERMINATOR VOL. 3: NUCLEAR WINTER. 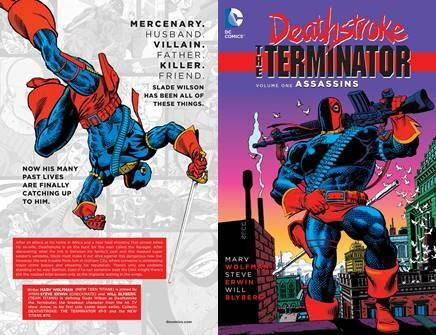 The unthinkable is happening: Deathstroke the Terminator is dying. The serum that gave Slade Wilson his enhanced abilities seems to be killing him, and the CIA is still hunting him for crimes he didn't commit. With no one to turn to, he must seek out his former enemies/allies, the Titans. But what he discovers at Titans Tower could lead him to salvation... or global nuclear war! Plus, Deathstroke must join forces with Peacemaker and the Huntress to stop the madman known as Kobra!! 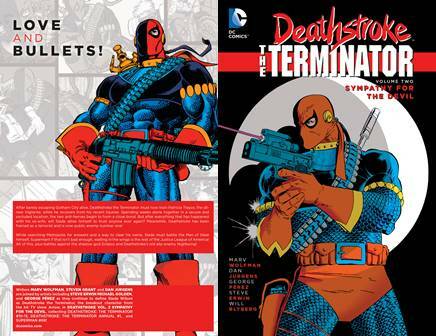 Collects DEATHSTROKE THE TERMINATOR (1991-1996) #14-20 and SHOWCASE '93 #6-11! It's a defining moment for the breakout character from the hit TV show Arrow! Deathstroke the Terminator has barely escaped Gotham City alive - and now he must train Patricia Trayce, the all-new Vigilante. Spending weeks alone together in a secure and secluded location, the two anti-heroes begin to form a close bond. But after everything that has happened with his ex-wife, will Slade allow himself to trust anyone ever again? Meanwhile, Deathstroke has been framed as a terrorist and is now public enemy number one. While searching Metropolis for answers and a way to clear his name, Slade must battle Superman himself - as the rest of the Justice League of America waits in the wings! 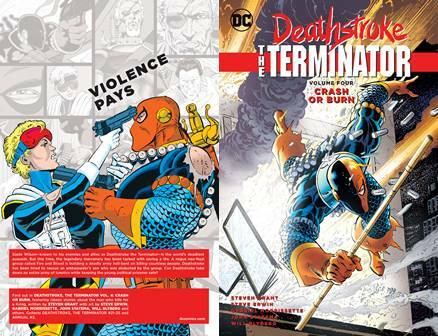 Writers Marv Wolfman, Steven Grant and Dan Jurgens are joined by artists including Steve Erwin Michael Golden, and George Pérez as they continue to define Slade Wilson as Deathstroke the Terminator in DEATHSTROKE VOL. 2 SYMPATHY FOR THE DEVIL, collecting DEATHSTROKE: THE TERMINATOR (1991-1996) #10-13, DEATHSTROKE: THE TERMINATOR ANNUAL #1, and SUPERMAN #68! Mercenary. Husband. Villain. Father. Killer. Friend. Slade Wilson has been all of these things. And and now his many past lives are finally catching up to him. After an attack at his home in Africa and a near fatal shooting that almost killed his ex-wife, Deathstroke is on the hunt for the man called the Ravager. Deathstroke must discover After discovering what the link is between his family's past and this masked super soldier's vendetta, Slade must make it out alive against this dangerous new foe. However, the real trouble finds him in. 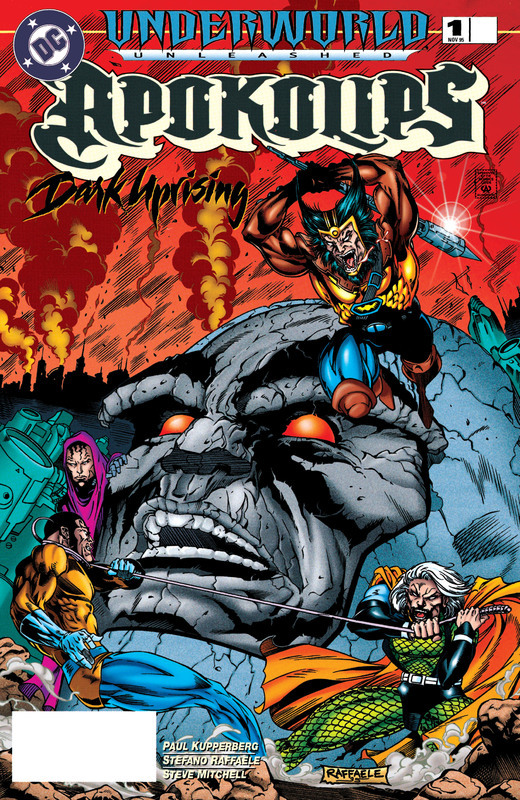 Then Deathstroke must travel to Gotham City, where someone is eliminating major crime bosses and smearing his reputation. There's only one problem standing in his way: , Batman. Even if he can somehow beat the Dark Knight there's still the masked killer known only as the Vigilante waiting in the wings. Writer Marv Wolfman (NEW TEEN TITANS) is joined by artists Steve Erwin (CHECKMATE) and Will Blyberg (TEAM TITANS) in defining Slade Wilson as Deathstroke the Terminator, the breakout character from the hit TV show Arrow, in his first solo comic book series. Collects , collecting DEATHSTROKE: THE TERMINATOR (1991-1996) #1-9 and the NEW TITANS #70. 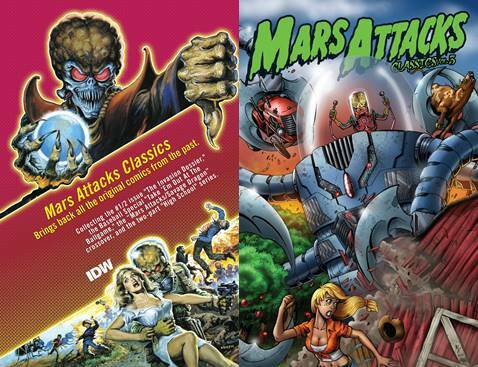 Volume 3 contains the #1/2 issue "The Invasion Dossier," the Baseball Special "Take Em Out At The Ballgame," the "Mars Attacks: Savage Dragon crossover," and the two-part "High School" series. THIS IS IT: The final battle for The Red begins here! Teen Titans foe Brother Blood has come to claim the mantle of avatar from Animal Man's daughter Maxine, murdering and plundering his way to power. Now faced with his family being even further torn apart, Buddy Baker must defeat this evil ... no matter what the cost. 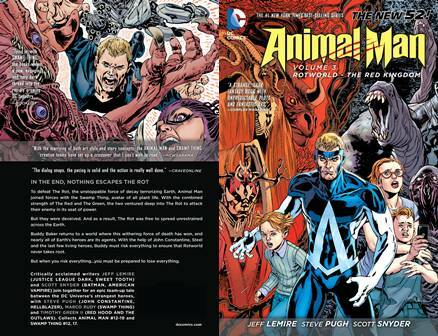 Critically acclaimed writer Jeff Lemire ends his run on the breakout title of The New 52 with this concluding chapter to his epic ANIMAL MAN story. With art from Rafael Albuquerque (AMERICAN VAMPIRE), Travel Foreman and Lemire himself, ANIMAL MAN VOL. 5: EVOLVE OR DIE! is a fitting ending to a modern classic. 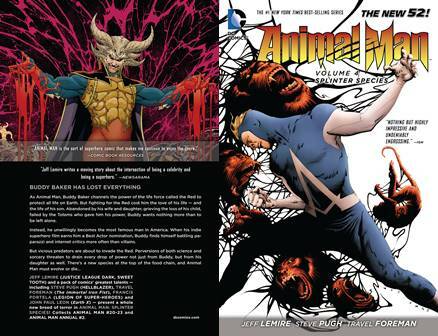 Collects ANIMAL MAN (2011-2014) #24-29. 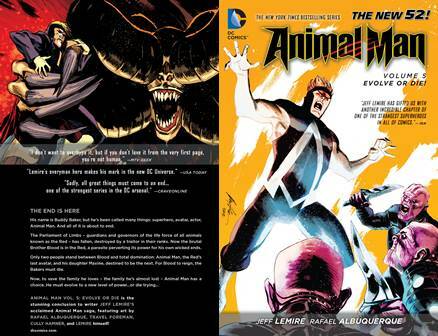 This volume collects (2011-2014) issues #20-23 and Animal Man Annual #2. 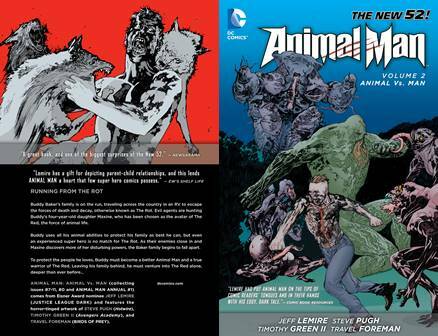 Collects Animal Man (2011-2014) issues #12-19 and Swamp Thing #12, #17. 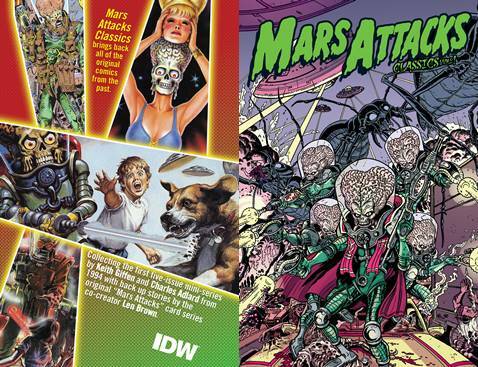 A scientist has created a portal to another dimension - one where monsters rule supreme! 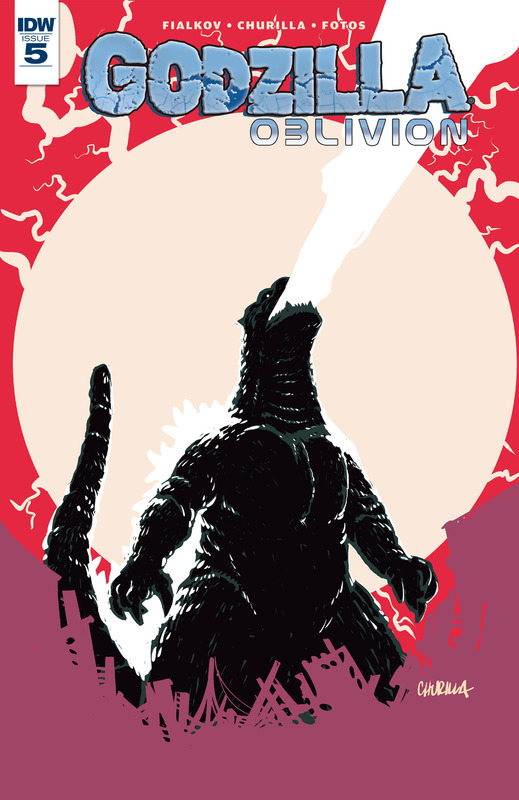 A terrifying expedition begins into a world where hope has died and Godzilla is the unrivaled King of the Monsters. 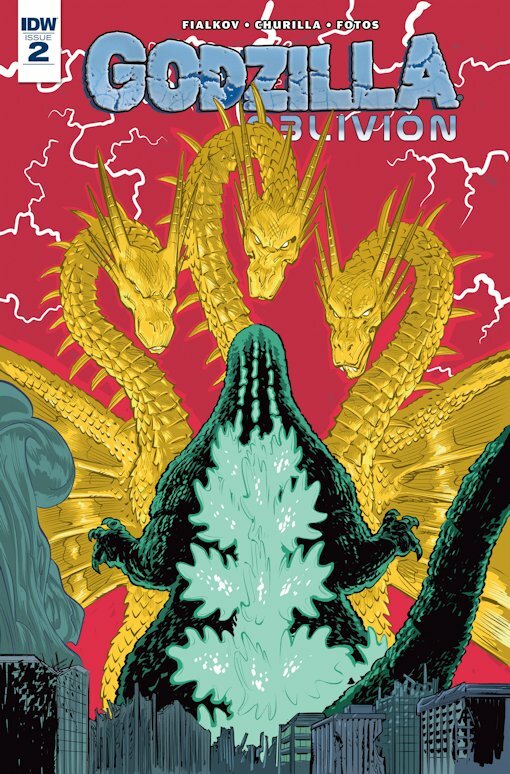 But what happens when a baby kaiju hitches a ride back to the original, monster-less dimension?